Up above is a sneak preview of my new "Hells Yeah!" Ballerina t-shirt, which will be a party of Wednesday's shop update. I am kind of in a "Hells Yeah!" kinda mood today since I have gotten so much done! It's my day off from work (day job), so I am spending it focusing on Etsy and making stuff. I burned a bunch of screens and printed a ton of t-shirts and totes with images including sewing machines, bison, moustaches, and more! I even cropped a bunch of photos on Photoshop, which I usually hate doing. Hopefully I will have a huge shop update prepared for Wednesday night. In the meantime, there are some new whale shirts in the shop. *Been watching some really good/thought provoking movies lately: Blue Valentine, the Social Network, The Shift, and more! *Had a little housewarming party the other day, and it was wonderful! So much good conversation, good food, and a good movie (In the Realms of the Unreal, about the art of Henry Darger). 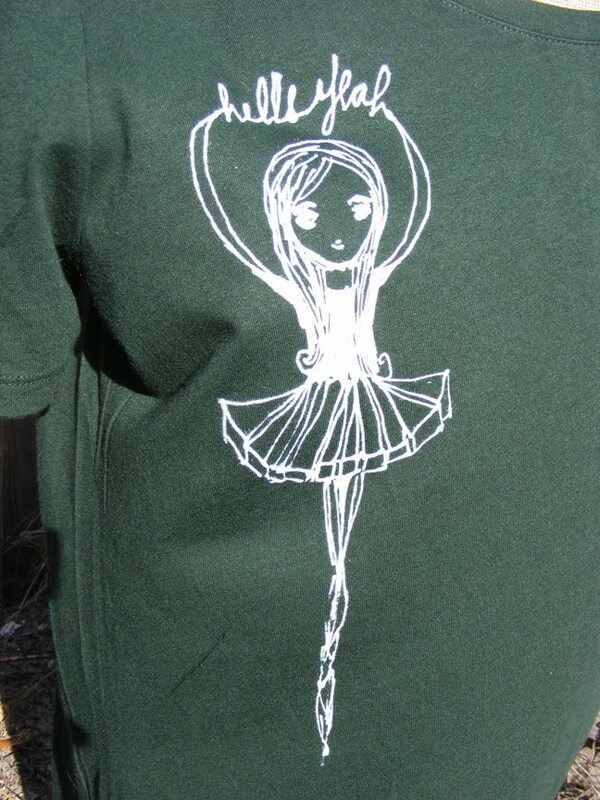 *I've been drawing and drawing and drawing...t-shirt designs for my day job and for my Etsy shop. It's funny how resistant I am to using the computer for making/editing the drawings... I still insist on sharpies and white out, always! That's all for now; gotta get back to work. But I will post again on Wednesday when I have some goodies ready for the shop update. Until then, I hope your week is off to a great start! I'm am envious of your Hells Yeah attitude today. I am just not feelin' it! I did get the laundry separated, but have yet to take it down to get started. D'oh.